If moisture gets between your laminate floors and the concrete underneath, it can be easy for mold to grow. This is a guide about can mold grow under laminate flooring on a concrete foundation?. 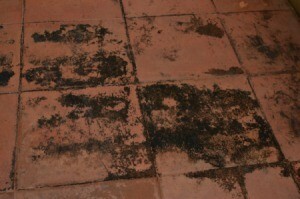 Question: Can Mold Grow Under Laminate Flooring on a Concrete Foundation? We had laminate flooring in our basement bathroom. The floor underneath it is concrete. We had a leaky toilet and the smell was awful! We tore up the laminate to discover the whole underside was moldy. Bleached the concrete, replaced the laminate with ceramic tile, and put in a new toilet; no more smell. So yes, it can grow mold! Yes, I just tore up flooring over a concrete slab. It was installed without a vapor barrier and had a musty smell. The joints on the laminate were starting to peak and buckle slightly. I was about 15 months old. There was white mold on the joints, which you could not see without removal.